Player-written game guides have been around almost as long as videogames themselves, though they haven't always been as easy to find as they are now. In the early days of the internet (before it was synonymous with "the web"), game guides were scattered around various Usenet newsgroups with no central repository. Long-time game journalist Andy Eddy would change this. In 1992, Eddy was Executive Editor of the now-defunct VideoGames and Computer Entertainment. Like many gaming publications of the time, the magazine included strategy guides and cheat codes in each issue. The editorial staff got help from FAQ writers on Usenet for these guides, and Eddy decided that this work should be collected somewhere. As the magazine did not have its own website at the time, Eddy uploaded the text files to the personal FTP space provided by his ISP. The FTP site became popular very quickly. "It was one of those things that just took off and gelled," writes Eddy in an email. "As more people knew about it, more people used it; as more FAQs authors heard about it, more would put the address in their FAQs and make a point of sending me a new or revised FAQ." As the web became the most common way to access and publish information online, people starting creating sites that mirrored the content of Eddy's FTP site. One of them was a gamer named Jeff Veasey, who created a site on his AOL user space called The Video Game FAQ Archive. In 1996, the site moved to its own domain and the name was shortened to GameFAQs. More than a decade and 45,000 contributions later, the site is one of the first stops many frustrated gamers make online to find answers and one of the main gathering places for guide writers. Although the FAQ writing community is largely based around sharing, most writers prefer their guides only be hosted on a handful of large sites like the CNET-owned GameFAQs and IGN FAQs, as sites with professional administrators are faster to post updates. Having your name attached to a guide with outdated or otherwise incorrect strategies can result in a flood of hate-mail. That said, it's the outpouring of thank-you emails that inspire many FAQ writers to keep up their time-consuming and largely voluntary efforts. "It's definitely a motivator," says Huijboom, who reads every email he receives regarding the 19 guides he's written. But it is a rather massive amount of work for a volunteer project. 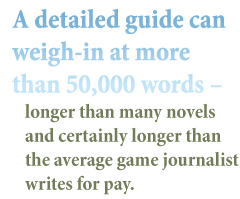 A detailed guide can weigh-in at more than 50,000 words - longer than many novels and certainly longer than the average game journalist writes for pay. Along with the lengthy writing, there's also the fact that guide writers have to make it through the sections that other gamers go running to the guide to solve. Patrick Summers, a general store clerk in small-town Montana who has written about 75 full walkthroughs in his spare time, taps the community for those sections. "They're a tremendously helpful knowledge pool," writes Summers in an email, noting the importance of giving credit in these situations.